How do we understand and value our own reproductive labor? How can we organize around this work in a way that is transformative both of our own lives and builds a collective opposition to a global capitalist system? Throughout the 1970s the Wages for Housework movement developed an analysis of women’s reproductive labor. Silvia Federici was a cofounder of the movement, working within the New York Wages for Housework Committee from 1972 to 1977. Interference Archive invites you to join with Federici for a slideshow and lecture addressing the movement in historical context and analyzing its contemporary relevance, followed by breakout groups to address key questions raised and a group discussion. Join us on January 18 for the official re-opening of our new location. 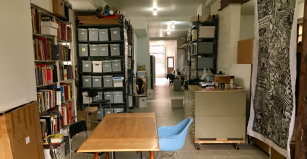 We are so thrilled to be up and running in our new home, and we’d like to take this time to recognize the community that keeps Interference Archive alive and that helped us with this big move. We’ll have multiple reasons to celebrate, as we also recognize the opening of no. NOT EVER. at Interference Archive.